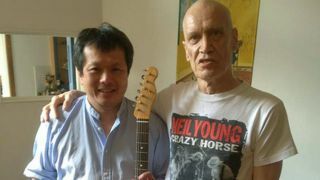 A Wilko Johnson fan who had a hunch about the true nature of his cancer put the guitar icon in touch with the doctor who saved his life. Surgeon and photographer Charlie Chan went to see Johnson live on what was supposed to be his farewell tour. The former Dr Feelgood man announced last year he had inoperable pancreatic cancer and had 10 months to live. But when Chan saw his hero in the flesh, he felt sure the diagnosis was wrong. He made contact with him and put him on a road that eventually ended with him announcing last week that he was free of cancer. Chan, from Cheltenham, tells the Gloucestershire Echo he got in touch with Wilko and the pair met in July last year and talked about many things, including his health. Chan had a hunch that Wilko’s diagnosis of the common form of pancreatic cancer, adenocarcinoma, might be wrong and that he might have a sarcoma or a neuroendocrine tumour. His hunch was spot on and Dr Huguet operated successfully on Wilko in May of this year. Chan adds: “Now Wilko is saying he’s cancer-free and that’s wonderful. He’s planning to get back to recording another album and playing with his band again. And I think he’s quite likely to be looking at a normal life expectancy. “It’s a great bonus that tens and hundreds of thousands of music fans will be able to enjoy more of his music, but the important thing is that he’ll be around for his family, he has two sons and a three-year-old grandson.